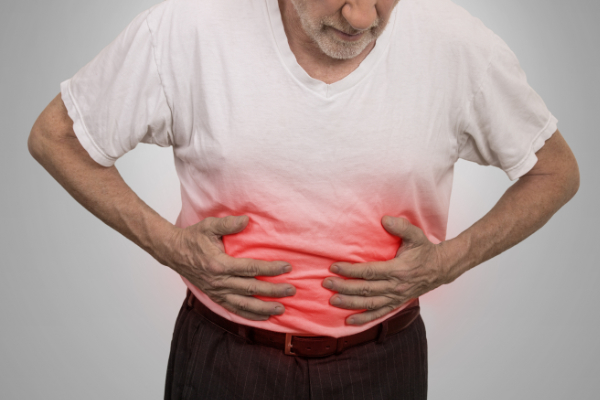 A chronic digestive disease that involves stomach acid or occasionally stomach contents, to flow back up the esophagus irritating the lining also known as acid reflux and heartburn. Symptoms can include a burning sensation in chest (heartburn), causing a sour/bitter taste in mouth, chest pain, difficulty swallowing, dry cough, hoarseness or sore throat, sensation of a lump in your throat. The weakening or abnormal relaxation of the esophageal sphincter (a circular band of muscle around the bottom part of the esophagus) can lead to stomach contents to be regurgitated. Certain over the counter medications are often used to block acid production to limit damage to lining, however, these medications do have side effects that also limit proper digestion and absorption of the food, and may also limit the production of the mucus lining that helps prevent against ulcers. Conditions that increase GERD include obesity, hiatal hernia, pregnancy, smoking, dry mouth, asthma, diabetes, delayed stomach emptying, connective tissue disorders as scleroderma, food sensitivities, anxiety and increased stress. Complications may include narrowing of the esophagus, esophageal ulcer and Barrett’s esophagus (precancerous changes). It is also important to note that chest pain with GERD can also be seen with a heart attack. Go to the hospital or call 911 if you also experience shortness of breath, jaw/arm pain with the chest pain. As with most chronic conditions, it is important to identify the source or at least the main triggers promoting GERD. For this reason, we will take a thorough history, assess lifestyle habits that includes diet, exercise, sleep, detoxification of the body, medications/supplements, mental/emotional state and lab work to determine what is contributing to the development of GERD. We often see emotional/mental involvement (i.e. anxiety and stress) that further add to this complication. Together with dietary changes, we will also address the emotional/mental component using herbs, homeopathy, acupuncture, and/or the Emotion Code. Where possible, we will incorporate a cleansing plan prior to initiating any long term treatment to rid the body of any physical obstacles (toxins) that impede greater function as well as improve the assimilation of changes once the plan begins. The treatment plan will be tailored to the individual, with alterations based on how the body responds. The more complete the approach and commitment to the treatment plan, the greater the results we see.